From what I hear, it's fall in most parts of the country; here in San Francisco, it was in the mid-seventies today, glorious and sunny. Everyone keeps telling me it's Indian summer, that sooner or later it's going to be foggy and cold, but for now, I love the weather just the way it is. That said, it's still San Francisco and thus unpredictable; we had a slight cold spell last week in which I had to break out my trench coat for the first time, and which also served as a reminder to me that I had to start working on the Fall Shopping Guide! So here we are. 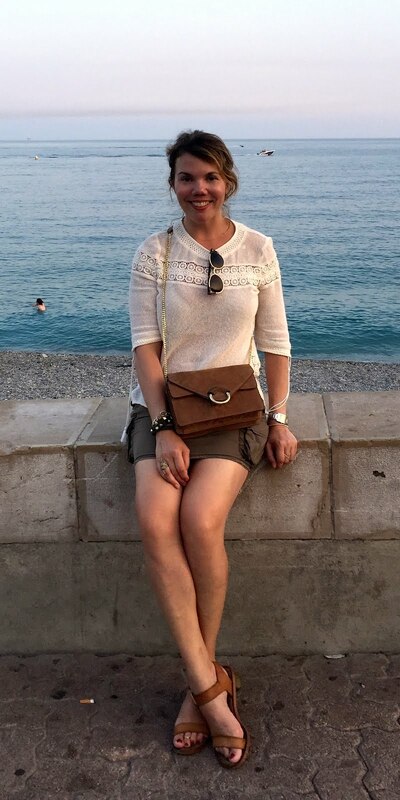 One of the many fashion quirks of this city is that, perhaps because the weather is more or less constantly on the cool side, people wear boots year round. Like, I got here Labor Day Weekend (which was uncharacteristically hot) and women were wearing knee-high boots. As longtime Cheryl Shops readers know, I love me some boots (especially black ones) so this was welcome news to me, and perhaps an excuse to buy more! 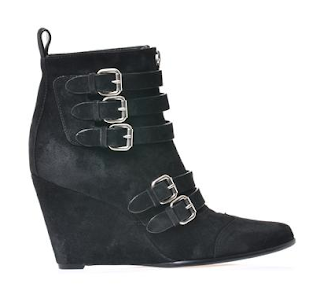 Something I've found my closet to be lacking is wedges; they're kind of perfect for SF in that they're more stable than stilettos but they still give you some height. Maybe they're not so practical for navigating the hills, but thankfully it's pretty flat where I live, so yay Lower Pac Heights! Slightly more palatable in price yet punkier in style are these Tabitha Simmons Harley boots, And while in the past I'd hesitate to wear wedge boots with skirts--they tend to have the unfortunate effect of making your legs look like Gumby's--these are unexpectedly streamlined and sculpted to flatter. If you're more of an uptown girl (or, in my case, an Upper Pac Heights girl), Derek Lam's Marta boots may be the answer: The leather is more polished, the hardware is gold, and the double buckles are a bit more understated. 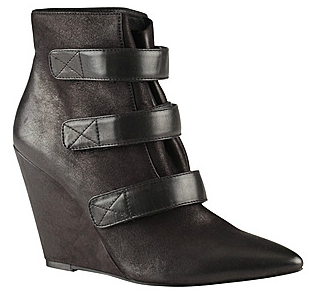 These Josie Buckle Boots seem a bit more casual and edgy, with a hidden wedge that hearkens back to Marant's sneakers. (See how it all comes full circle?) 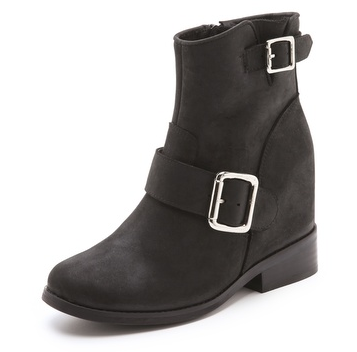 Strategically placed buckles help shape the boot and avoid the dreaded blocky effect. Along similar lines, these Jeffrey Campbell Willis Boots look like biker boots but have a hidden wedge for a stealth leg-lengthening effect. So these are perfect for vain people like me who refuse to wear flats ever. 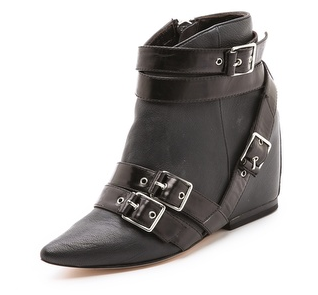 The toe is rounder and the buckles more basic than the rest of the styles here, but now that I'm a Californian, I feel like I need to represent the casual girls out there. 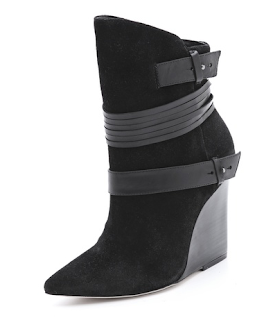 Back to chic, Alice & Olivia's Owen Wedge Boots take an even simpler approach to the buckled effect; I like the combination of skinny and thicker straps as well as the super-pointy toe. I saw these at Alice & Olivia's presentation last February, and believe me, they made quite the lasting impression. 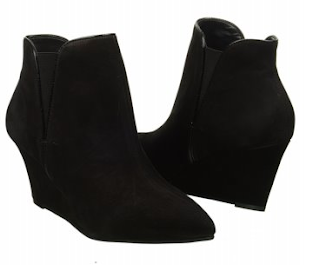 For the super minimalist, Steve Madden's Jossie boots have no buckles whatsoever, but the pointy toe and streamlined wedge shape remain. And considering the challenge of finding actual leather boots for under $150, I think these are a pretty solid find (with a very comfortable 2-3/4" heel). 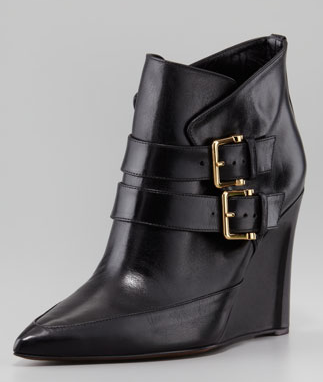 For those totally on a budget, there are these Riawna boots from ShoeDazzle, currently available for the introductory price of $24.98 ($49.98 regularly). Yes, they are synthetic, and the hardware is a bit on the flashy side, but the shape is right and they do somehow still have a Marant-esque vibe. 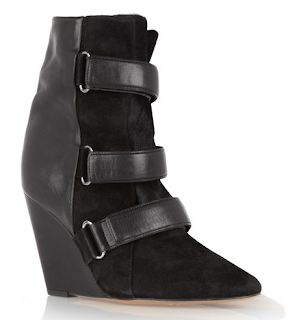 But for the closest Marant experience--without the Marant sticker shock--I recommend Aldo's Jacelyn wedge boots, a point-for-point homage from the mix of materials to the adjustable buckles. Actually leather and a mere $140, they are the most obvious thing since beautiful, sunny weather in the mid-70s. The weather might not last that much longer, but I have a feeling I'll be wearing these boots for months, if not years, to come.